Recommendation: I do so love a tol/smol and AoS provides both Fitzmack and now for the ladies Simmorse. I agree with Jemma's assessment, Bobbi is gorgeous. Jemma is also precious. Summary: The vigilante known as Soldier: 76 sends messages to a number he thinks belongs to a dead man, and it does, technically, except Reaper reads them, every last one, and he can only stay a ghost for so long. Recommendation: These two are killing me with the feels, their tension is so fraught with history, betrayal and love. I love that they get an after. I love that Jesse gets to throw in his two cents. And I love the imagery of Dia de los Muertos and what it can mean for these old soldiers. Julie has been trying to get me to watch The Greatest Showman ever since it came out, and yesterday I finally acquiesced and did it, and oh my God, you guys, Zac Efron grew up hot, and I super ship his character Phillip Carlyle with Hugh Jackman’s P. T. Barnum although I also liked their canon love interests so maybe they’ll have one big poly showbiz family??? BUT SERIOUSLY THOUGH, their big number together (“The Other Side”) is such a seduction scene. Now admittedly Barnum is trying to woo Carlyle away from the hoity toity theater to the fun of the circus, not just generally wooing, but nonetheless he does so by jumping up on a table with his sleeves rolled up and dancing while Carlyle watches, legs spread, and then responds by dancing on the bar, and the tables, and then flips his red top hat on his head, and he aaaalmost walks out… and Barnum makes one last overture… and Carlyle stops, and then swings back to bargain for a percentage of the profits. And then! And then! Near the end of the movie, when the circus catches fire, Carlyle races into the burning building to save his ladylove the acrobat Anne (don’t worry, she’s shows up fine like five seconds later), and then Barnum runs in to save him and bridal carries his prone smoke-stained body from the building right after it collapses. Yes. AFTER it collapses. But earlier on they do have a total epic duet that makes full use of the fact that Anne is an acrobat (I particularly like the bit where Phillip leaps off a balcony into her arms as she swoops around the arena on her trapeze, oh my God) so even if the filmmakers didn’t exploit the hurt/comfort possibilities to the fullest possible extent they did at least go big there. I feel like I should have something more incisive to say, or historical criticisms or something (did anyone ever actually picket Barnum's circus in protest against the freak show? ), but in fact my main takeaway from this movie was that Zac Efron could probably have sexual chemistry with a tree if he needed to. Would you pay to drive this famous street? San Francisco officials say the famously crooked Lombard St. is too crowded, and they may enact a toll to keep it under control. Environmental activists across the globe took drastic measures this week to demand that their governments act to curb climate change. John: What about the 'jumper? Rodney: There's no lube in the 'jumper. John: You were supposed to replace it! Rodney: No, you were the last one that bottomed, so you were supposed to replace it! Summary: Glyph expected a peaceful, if lonely, few weeks of solo datalogging on a brand-new planet. Blackarachnia expected to have plenty of space to experiment—and mope—on an uninhabited planet that Cybertron wasn't using anyway. Neither set of expectations worked out. Notes: Written as a fill for the tf_rare_pairing prompt "TFA Blackarachnia/Glyph, "things left behind"". I haven't ventured into TFA in forever and never considered this ship (rarest of the rarepairs, yay! ), but the prompt grabbed me and wouldn't let go until I wrote something. Probably around 5-6 chapters total, but we'll see how it goes--I'm flying by the seat of my pants here, just a bit. Something else that Star Trek: Star Charts has inspired me about...and I don't think I want to discuss it on TrekBBS, because "story idea" prohibitions. Looking at the Known Space map in the second fold-out at the back of that book...we see a 750-lightyear "sphere" with breakout "bubbles" around several stars. We are not focusing on them, but upon the coreward Beta Quadrant side, where the furthest-coreward systems tagged as Federation-affiliated are Antares - see also Memory Alpha - and Eta Lupi AKA Cerberus. First reasonable assumption to propose: there should be networks of routes connecting Antares and Eta Lupi to each other. Second reasonable assumption: there should be networks of routes connecting those two systems to each of the latter group of seven systems as well. Third reasonable assumption: along those routes established in assumptions one and two, there will be outposts, colonies, starbases, full-member worlds and their holdings, and independent star-nations and their holdings. Yet to have been documented on any official Trek series. I don't yet know if any of the fan fictions - text, podcast, video - have covered that part of the Orion Arm. There could be stuff hidden in Archive of Our Own, whose creators have reached these same assumptions. swearing I’d never go back? And hadn’t you kissed the rain from my mouth? into the further room of love? we licked from each other’s hands? as lovely as thunder, and damp grass, and flame? Holidays occurring for some this weekend; is that influencing your cleaning plans? What are your goals, if any? Comment and we'll cheer each other along! Along with setting goals, how are you going to break up your tasks and/or make them more do-able? I will listen to an audiobook while cleaning, and plan to spread out my tasks over the day today, with time for some tv-watching and catching up on emails. Seven miles in half an hour. This weekly roundup includes fics written (at least in part) during the 1k1h sprints and/or the Weekend Writing Marathon events. Fics are ordered first by fandom, then by word count from smallest to largest. Summary: “Just for tonight” and an assortment of other lies. Summary: Q saves Eliot from the Monster. Summary: Budapest was a bogeyman. No one knew what had happened in Budapest. All anyone knew for sure was that it was a highly classified mission both Natasha and Clint went on and that it nearly went belly up. That didn’t stop anyone from speculating of course. Summary: After his deadly decision at Fehl Prime, Lieutenant James Vega runs off to a shady bar in Omega to numb his sorrows. But a personal request from Admiral Anderson has him swallowing his pride–hiding his pain–and running security for Commander Shepard’s house arrest. When the Reapers hit Earth and they escape together, he learns every heroic thing he’s heard about Jane Shepard is true, and they share more in common than the grim heart of a soldier. Summary: With their relationship still so fresh, Claire knows exactly how much it means for Kaia to allow her to take her on this ride. Summary: Amanda still has nightmares. When she wakes to find her wife isn’t in bed she goes to search for her. It makes Amanda wish all nightmares were only when you were sleeping. Summary: Cass is starting at her phone like she’s ready to kill and about to die. Nate provides tea and food, and tries to provide a listening ear. Have you posted a fic recently? Any active WWM participant can Submit your fic here by midnight EST Wednesday and it will be included on next Friday’s WWM Fic Roundup post. Easter is a popular time for America's bunny- and chick-shaped marshmallows friends known as Peeps. Every day, about 5.5 million Peeps are produced, roughly 2 billion a year. An Ohio church is apologizing for an "inappropriate" Easter lesson in which a pastor urged students to spit on him, slap him and cut him with a steak knife. The internet won't let me copy-and-paste, but today I'd like to mention The Duck Hunt by mrspencil. It's an epic of Holmes visiting Trevor and going duck hunting and it's brilliant. Whenever I sit down to write a poem about Sherlock Holmes, I ask myself if my friend has already written an epic on the subject I'm considering and in at least two cases, I've been correct. And the most famous of Holmesian verse. 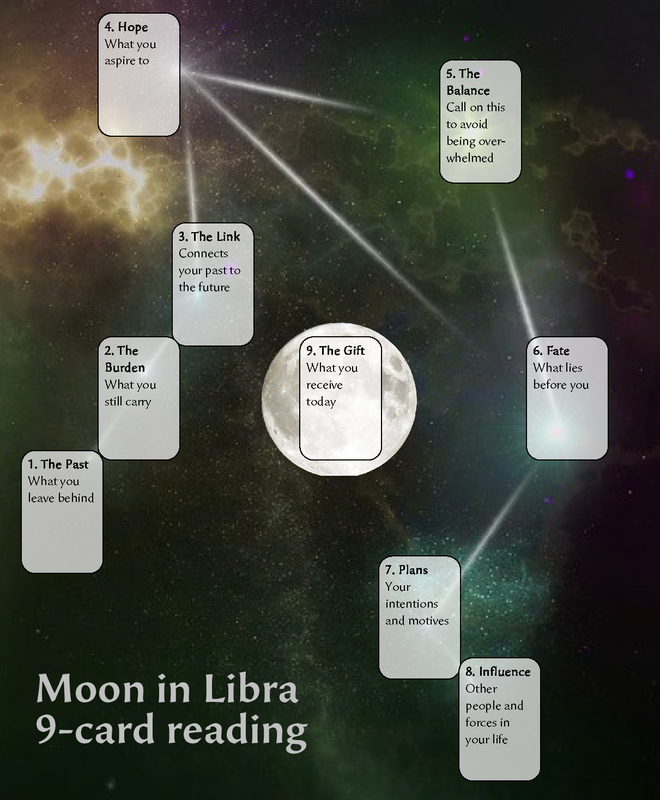 The topic of specialized readings came up on a Discord channel, so I made a layout for the full moon in Libra (that's today, technically in about 5 hours; the next day and a half or so are still considered "full moon" for magical workings). Summary: In the cave of the sea witch you sign away your voice in pursuit of a vision. Warnings: For art: some blood splatter, some rude words. For fic: way more than that! Artist notes: This year's smallfandom bang marks a first for me: a comics fandom! Despite the story being not my usual thing at all, I enjoyed it immensely, which is all down to the author's skill. A++ would heartily recommend this read! Unusually for me, there is also only one piece of art. Except, of course, this consists of several different pieces all related to the story... I had such fun doing this and also figured out some new ways of putting stuff together. Thank you to my author rokhal for encouragement and scans! Resource credits here. Colin Donnell is leaving "Chicago Med." This book is so good. It's about the intersecting lives of three women--a peasant, Wanda; the daughter of a moneylender, Miryem; and Irina, a woman forced to marry the tsar. Novik plays with fairytale elements: the power of a name, spinning straw into gold, magic, transformation. She also gives Miryem and her family a rich Jewish history and community that play a profound role in the story. This book brought me to tears multiple times, and it made me smile, and it made me jealous of all the beautifully crafted sentences. I cannot recommend this highly enough. I thoroughly enjoyed Uprooted, but Spinning Silver is an order of magnitude better. This is an unfinished manuscript of four chapters plus an introductory note with some biographical details about Alcott that help contextualize the manuscript (such as her sister May's career as an artist). The first chapter is almost entirely dialogue, the second is epistolary, and the final two chapters are traditional prose. I really like what's there, but it's very clear that the manuscript is unfinished. Chapter 3 is a thread left dangling, and chapter 4 comes out of nowhere with whatever would have segued from 3 to 4 missing. It's worth a read, though, especially for Alcott's ideas about women and art and female communities of artists. A former Tallassee police investigator pleaded guilty to assaulting a handcuffed 24-year-old man after his arrest. cnn_feed - Would you pay to drive this famous street? cnn_feed - Climate protests this week caused major disruption. That was the point. dewline - TREK: Antares-Cerberus Reach?